More than a year after Fantastic Four bombed and director Josh Trank was fired from his Star Wars spin-off, the disgraced director has finally announced his next project. And it sounds like it might just be able to resurrect his career. Especially with Tom Hardy taking the role of leading man. 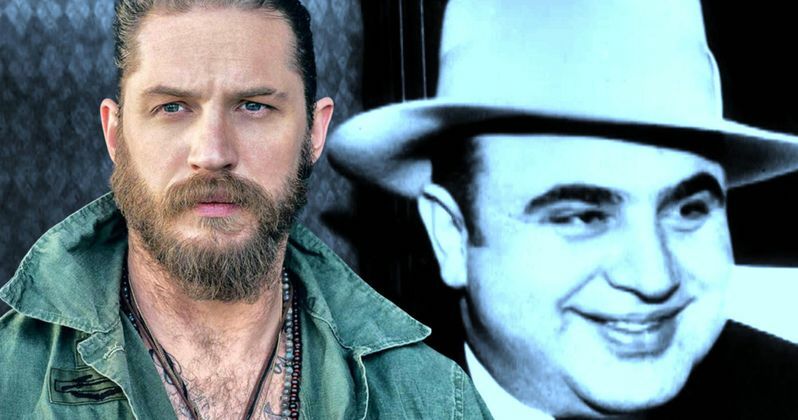 Tom Hardy will play legendary American gangster Al Capone in the upcoming biopic Fonzo. The project will be written and directed by Josh Trank. Lawrence Bender, who is best known for working with Quentin Tarantino, will produce alongside Russell Ackerman and John Schoenfelder of Addictive Pictures. The storyline of Fonzo follows Capone in the final days of his life. The notorious criminal, who has been immortalized in numerous movies, passed away in 1947 at the age of 48. Tom Hardy will be less than ten years younger than Capone, playing the role at 39. It's interesting to note that Capone was a Capricorn, while Hardy is a Virgo. If you believe in astrology, these two signs are said to be very similar in character, and is actually a perfect fit for Hardy, who is very choosey when it comes to picking roles. Fonzo has reportedly already darted production. Deadline delivers the news. They offer this synopsis. "[Fonzo] centers on Alfonse Capone, the ruthless businessman and bootlegger who ruled Chicago with an iron fist before being famously taken down by Eliot Ness. After nearly a decade of imprisonment, dementia rots his mind and his past becomes present as harrowing memories of his violent and brutal origins melt into his waking life." This will be Josh Trank's first role since taking the helm of 20th Century Fox's superhero bomb Fantastic Four, which reportedly cost the studio millions of dollars. Trank made a name for himself with his directorial debut Chronicle, but his disruptive and strange behavior on the set of Fantastic Four is reportedly what got him fired from his Star Wars movie, which was rumored to revolve around Boba Fett. Perhaps Fonzo will get the young filmmaker's career back on the right track. Tom Hardy Is Tired of Acting, Is He Ready to Retire?